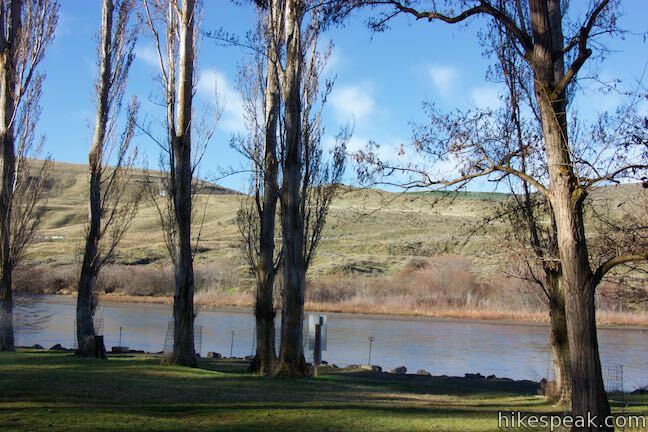 Deschutes River State Recreation Area is located east of The Dalles, Oregon (where spring arrives earlier than it does in areas west of the Columbia River Gorge). 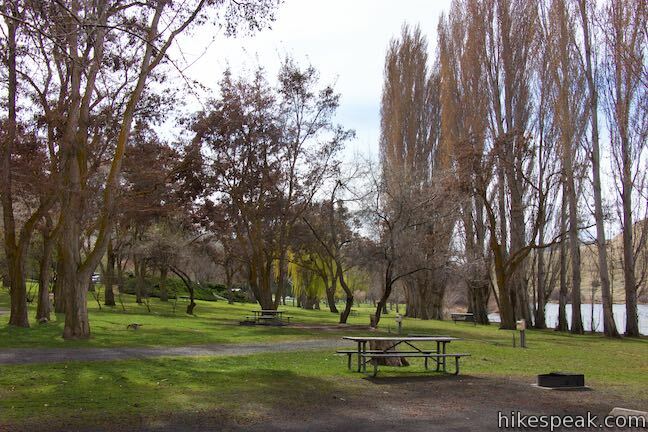 Bordering the Deschutes River beside its meeting with the Columbia River, the park’s grassy and shaded campground is a relaxing place to stay. 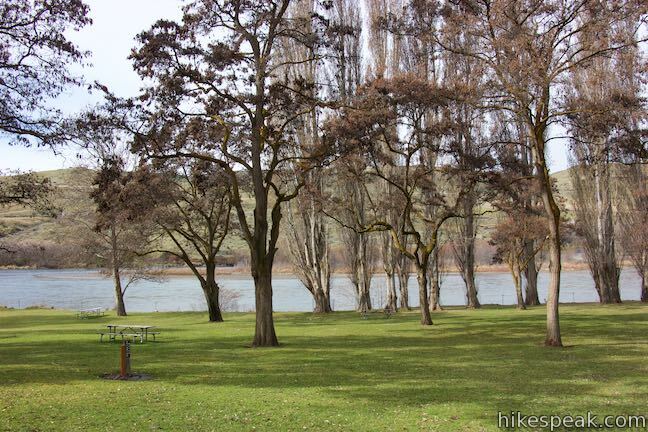 This 63-site campground (with 34 sites with electrical hookups, 25 more primitive sites, and 4 group sites) has river views, ample amenities, and hiking along the Deschutes River. When Portland and other parts of Oregon are clouded by February rains, wildflowers start to appear in Deschutes Canyon. 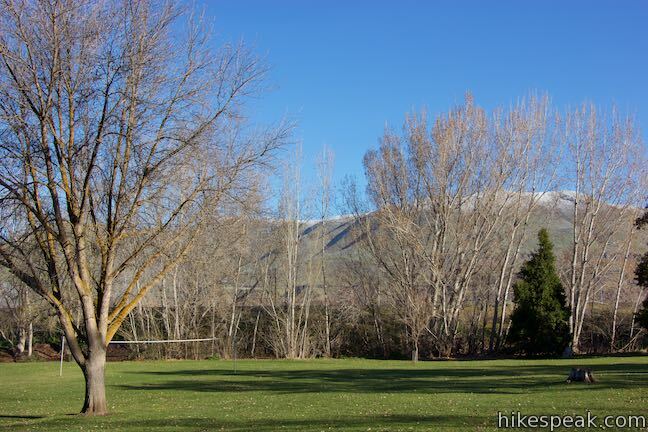 The landscape turns a welcoming green in the spring, before the canyon heats up and browns in the summer. 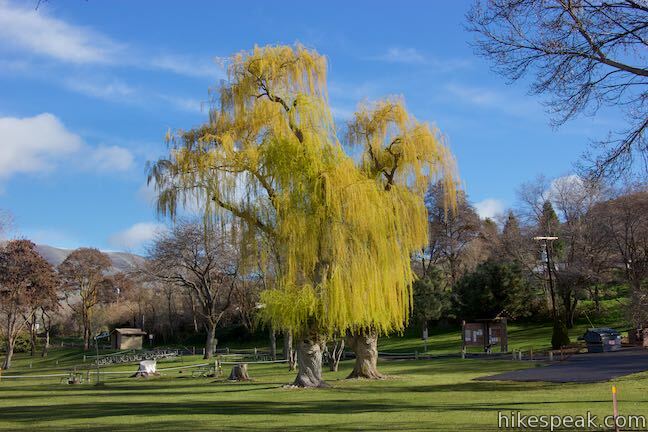 The river, with its mellow rapids and grassy isles, offers four-season appeal. 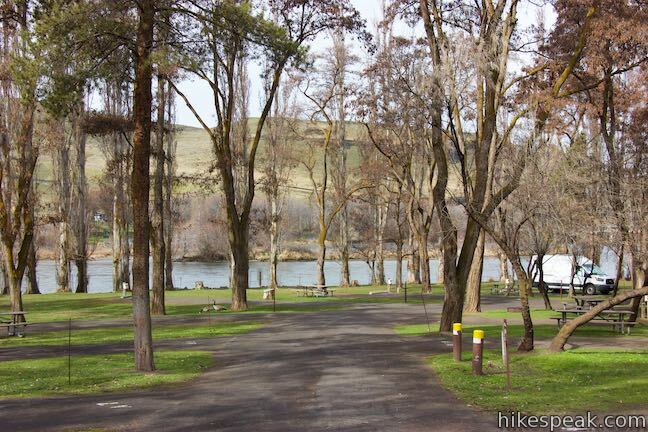 Upon entering Deschutes River State Recreation Area, find all of the campground loops on the right. The first loop is the A Loop, which boasts 34 sites with electrical hookups. 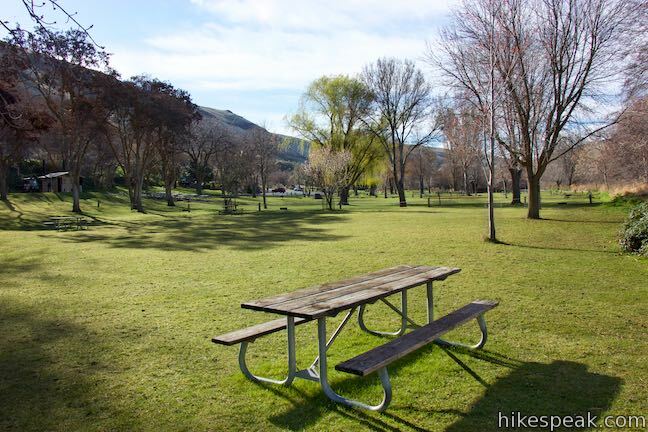 Sites have paved parking spots that are roomy enough for large RVs, as well as picnic tables, fire rings, and plenty of well-manicured grass. 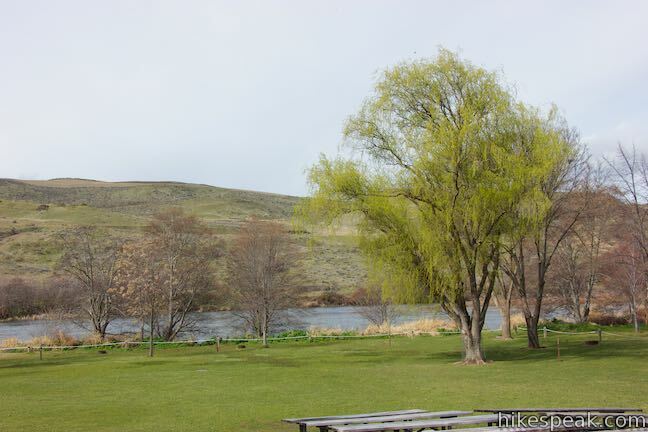 The Deschutes River flows past the campground and seems to be visible from every site. In the middle of the loop is a bathroom with flush toilets and hot showers. Drinking water spigots are available between the sites (although the water shuts off during the winter). For those with RVs, campervans, and trailers, the A Loop is the section of the campground to target. 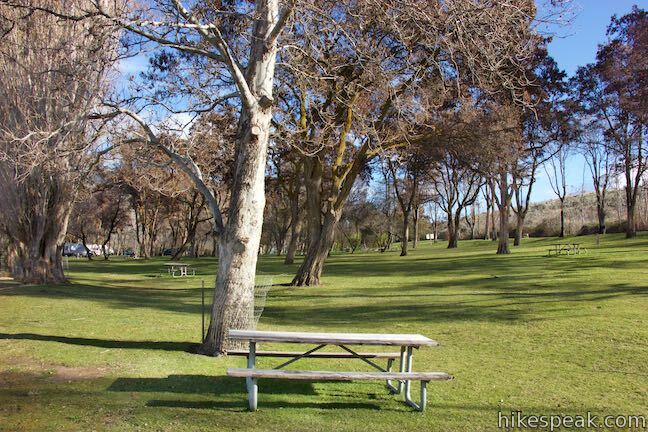 A picnic area (day use area) separates the A Loop from the other loops. 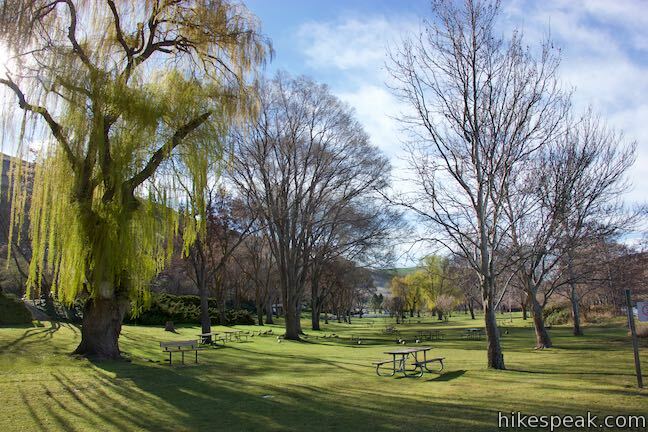 The remaining campground loops have bigger lawns and fewer trees. The B Loop has 14 sites that do not have electricity. 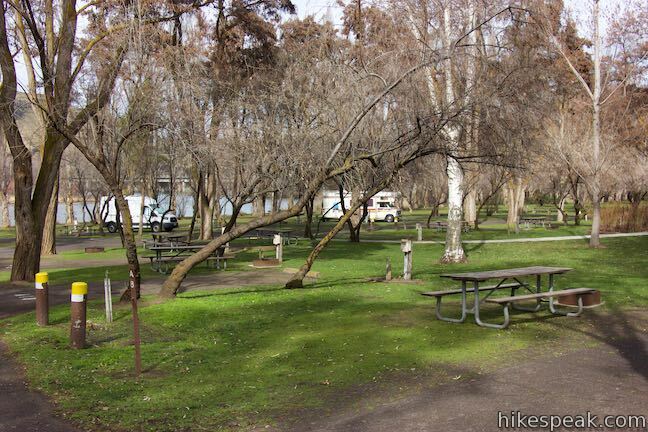 Tents and RVs can use these “primitive” sites (parking RVs is allowed). 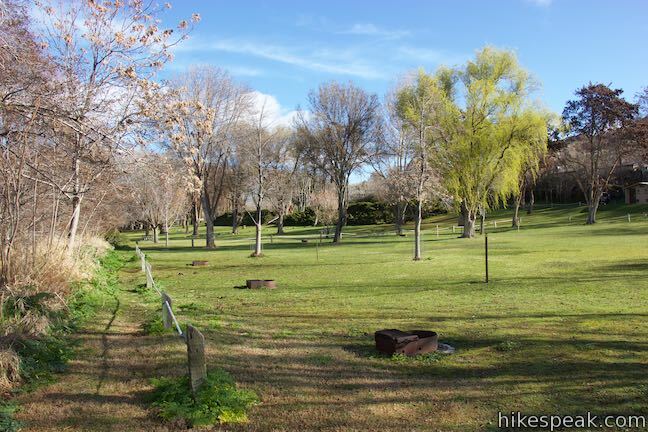 The G Loop has 4 group camping areas that can be reserved in advance. 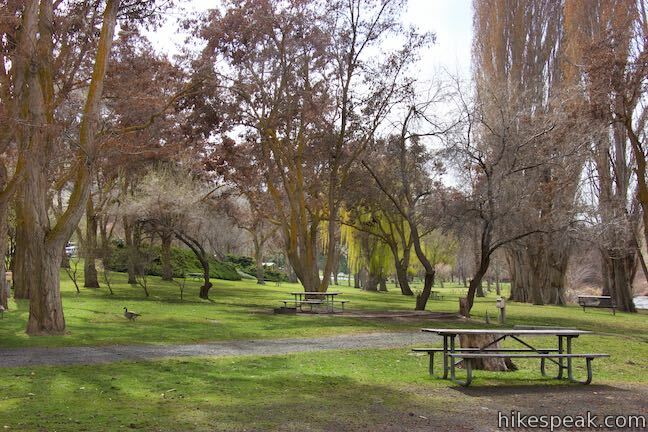 Each area has room for 25 people, accommodating up to five tents or RVs. The group area has vault toilets and access to nearby potable water. The southern-most loop (nearest to the trailhead) is the T Loop, which has 11 primitive sites that are designed for tents and smaller RVs. The T Loop has a vehicle length restriction of 24 feet from bumper to bumper, which excludes most trailers. This grassy area also offers access to vault toilets and potable water. Throughout most of the year, sites along the A Loop are $24 per night. Primitive sites along the B and T Loops are $10 per night. Group sites on the G Loop are $71 per night. Sites may be reserved online or by calling (800) 452-5787 during business hours. 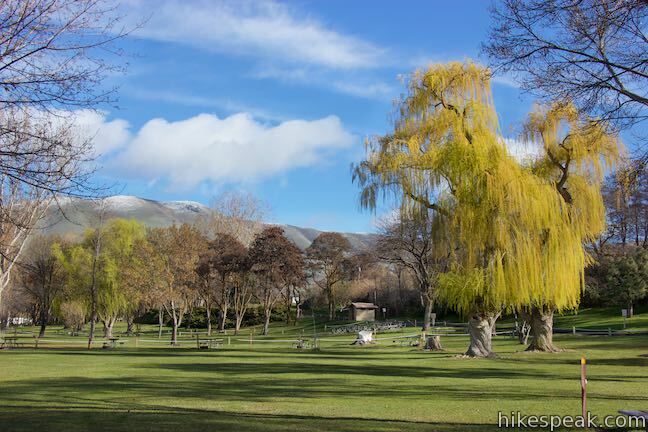 During the less-busy season, campground operations change. The A Loop becomes first-come first-serve from November 1 through April 15 (no reservations). The B, G, and T Loops close down. The rates for the A Loop are modified for those who aren’t plugging in. Sites are $24 for those using the electric hookups and $10 for those not using the electricity (prices as of 2018). 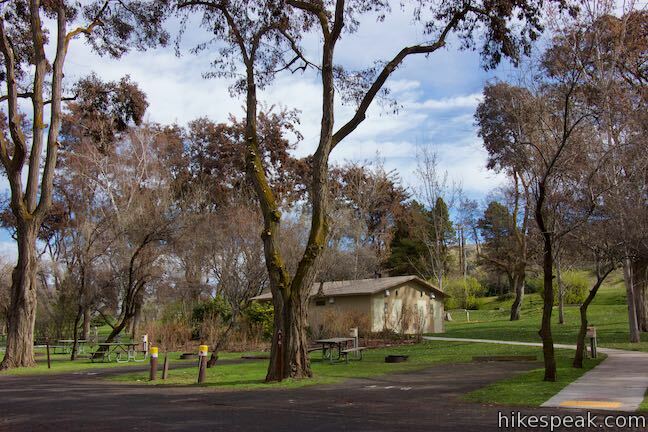 A fee of $7 is charged to park a second vehicle at a campsite. The same fee is applied for overnight parking in other areas of the park. 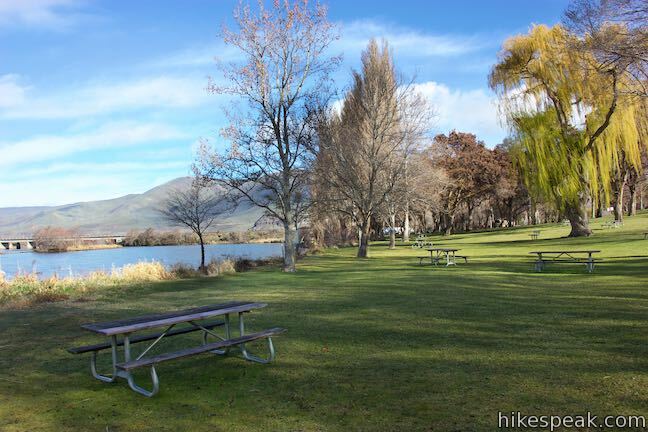 Deschutes River State Recreation Area does not have day use fees (and only charges for campsites and overnight parking). 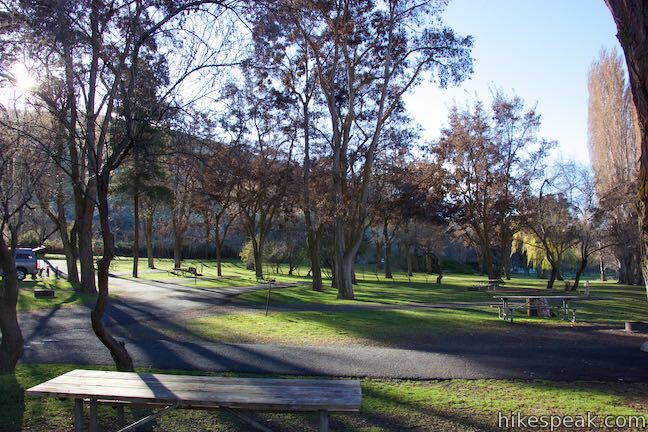 If you aren’t arriving with a reservation, self-register for a site within your first thirty minutes at the campground. Check in to sites after 4 p.m. and check out by 1 p.m. Quiet hours are from 10 p.m. to 7 a.m. 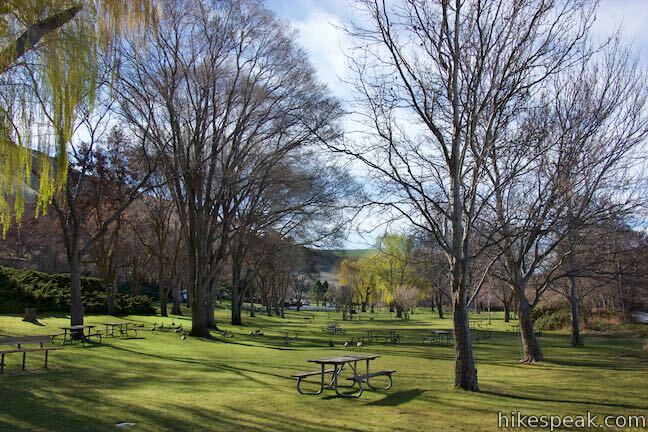 If you are staying in the campground on Wednesday morning, the sound of lawn mowers may wake you up. Campfires are prohibited during the summer months of July, August, and September. 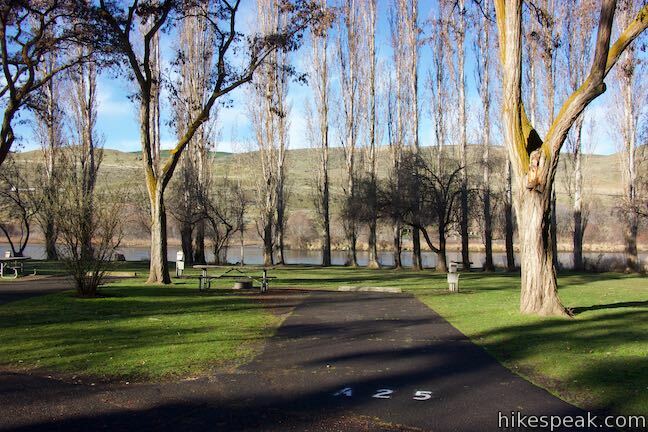 Pets are allowed in Deschutes River State Recreation Area, but should be leashed when not in vehicles and tents. 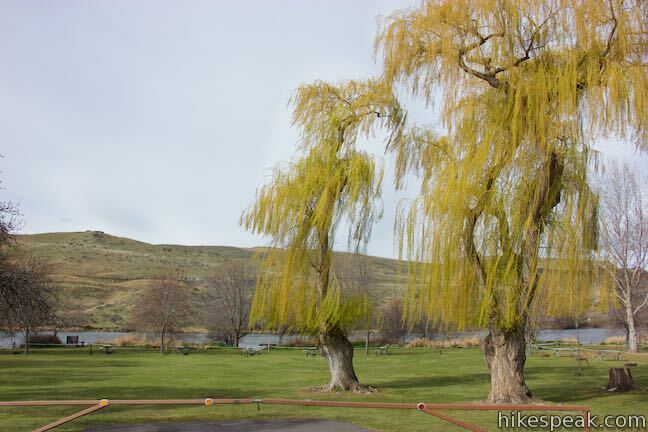 Deschutes River State Recreation Area is a short distance off Interstate 84, making it convenient for travelers. While you won’t hear freeway noise at the campground (thanks to the noise-canceling river), campers can expect to hear numerous trains passing by on the nearby rail line. 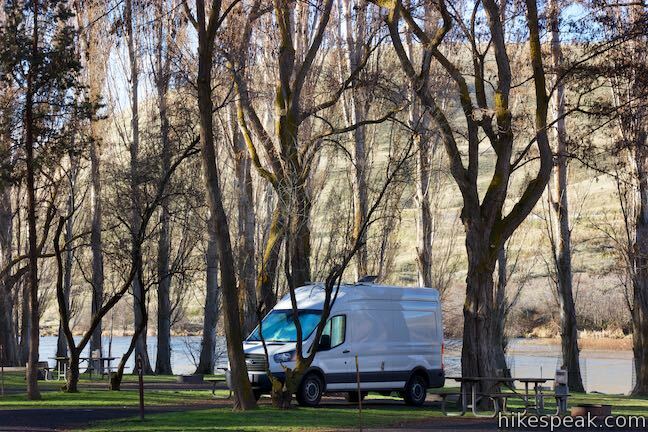 If you want to camp any closer to the Deschutes River, you’ll need a boat! 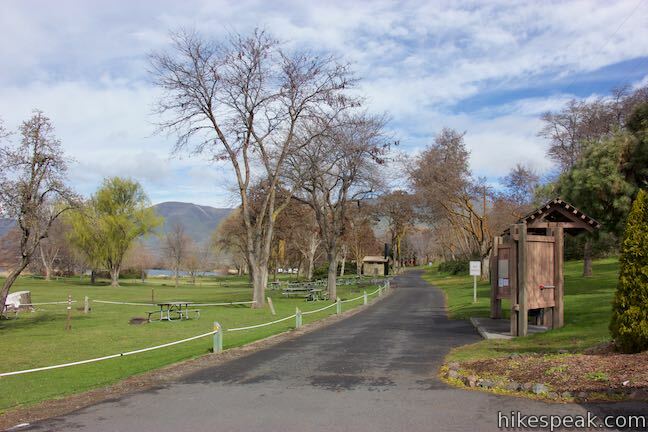 To get to the campground: From The Dalles, which is 75 miles east of Portland, travel east on Interstate 84 for 12 miles to exit 97. At the end of the offramp, turn right and make an immediate left on Route 206. Drive east for 3 miles. 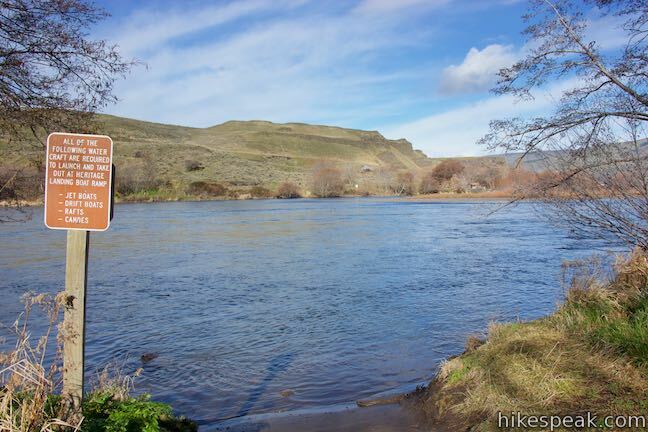 Cross a bridge over the Deschutes River and turn right into the entrance of Deschutes River State Recreation Area. Pass a trailhead on the left to approach the campground loops on the right side of the road. These photos were taken in March of 2018. Click to enlarge. 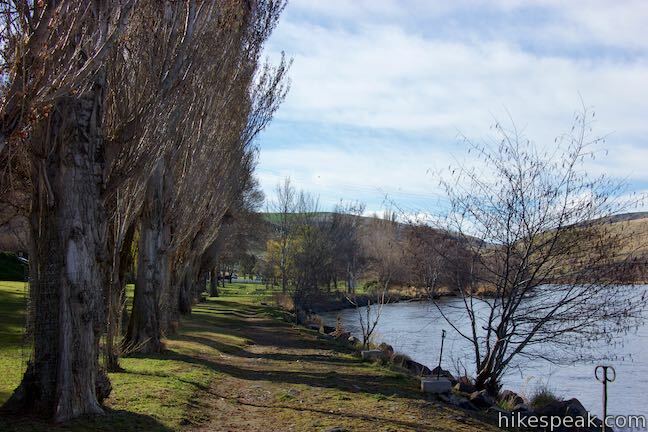 This 3.1-mile loop in Deschutes River State Recreation Area borders the bottom of the Deschutes River and explores views from the water’s edge and a grassy terrace. 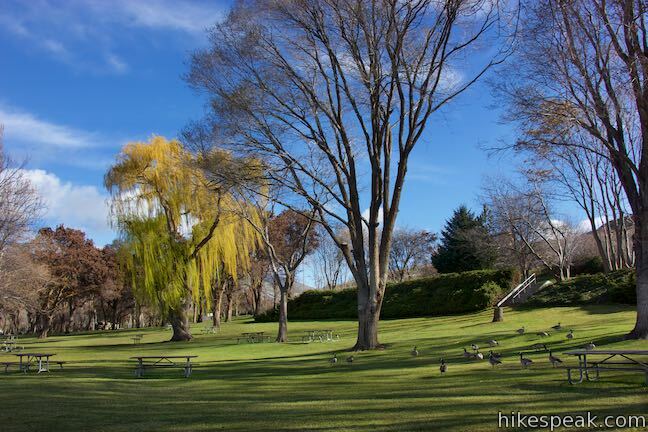 This short walk leads to a clifftop viewpoint facing a bold 180-foot waterfall in a basalt-walled canyon.